It's been a while since I've read an entire series and loved it from beginning to end. 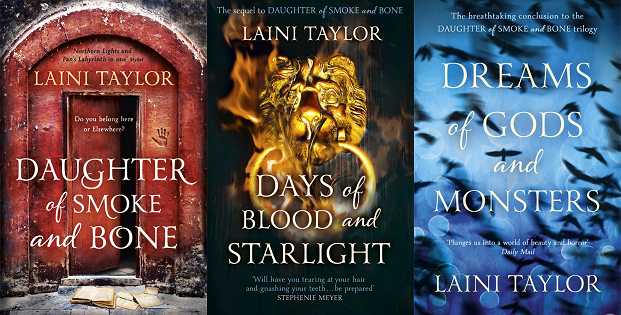 Daughter of Smoke and Bone has officially become one of my favourite series that I'm surprised it took me ages to finish it off. I'm so glad I did though because it was an amazing read! Daughter of Smoke and Bone was pleasantly unexpected. I do read a lot of Young Adult fantasy, but I'm not huge on paranormal reads - angels and demons etc. Yet, this sucked me in right away. Taylor's writing is rich with description and very vivid. It does have a flowery, poetic feel to it but isn't overdone. I feel like part of DoSaB's strength is its writing, relaying strong characters and world building. The world itself is fascinating and different, which is always a plus. It's set in Prague but combined with fantasy elements produces a mystical world that I was excited to explore. I found Karou stood out against the backdrop, not just because of her blue hair but her abilities. As the series progresses there is so much more to her that I fell in love with and her skills are impressive. Karou left a strong impression on me with her smart and caring nature, but also her fiery and independent characteristics. Akiva was written in a typical male protagonist way. He's handsome, strong and the hero by nature. However, it's hard not to fall for his charms, the way he's loyal to just Karou and how he tries to hard to please her. What I loved most about him was how he completed Karou and the emotions their relationship made me feel. Even just from the first novel, it struck me that I rarely actually completely understand the characters emotions. Yet, by the end of DoSaB my heart ached for both of them and the challenges they were to face. It was sad and almost suffocating - I know, how dramatic. I was completely invested in their relationship and rooted for them so hard! Days of Blood and Starlight made for great character and plot development. Karou learns so much more about herself and in turn we see her grow and blossom into the person she is suppose to be. It's in this novel that Karou learns of her purpose and the role she's suppose to undertake. Taylor also expands the world, introducing more magical realms that add to the complexity of the novel. It set up for an epic finale that, when finished, consolidated my love for this series. Dreams of God and Monsters transported me over various realms and shook me from one emotional spectrum to the other. There were so many highs and lows that left me overly attached to the novel. A lot of DoGaM was resolving the conflict, which left relationship and character progression stilted. By the end though Taylor tied all loose ends and I did find that even though the ending wasn't desired, it was realistic and hopeful. The story behind this series talks about hope a lot and it tries to relay this through Karou and Akiva's actions, and I was glad to see that it was possible to feel this at the end. I definitely recommend Daughter of Smoke and Bone finding that it just doesn't entertain but also left an impression on me. Perhaps I've been overdramatic, I mean I wrote an essay, but it's definitely a series to rave about. Any book that has me deeply involved and is memorable is a favourite in my books!